Carney: A Game-Changer for the GBP? BOC Governor Mark Carney sparked volatility on the charts on Thursday, but not on CAD pairs. Instead, he rocked the pound towards the end of the week’s trading! In case you’ve been locked up in your man cave catching up on your favorite TV shows, he was handpicked to replace Mervyn King as the next BOE head honcho July of this year. 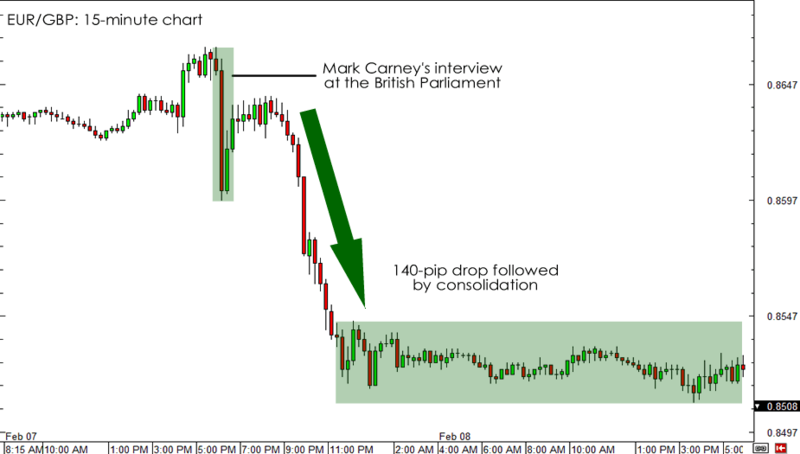 Consequently, market participants paid very close attention to what Carney had to say. This explains why we saw a lot of movement in GBP pairs ahead of the central bank’s rate decision. In fact, the British Parliament’s interview with him turned out to be more entertaining than the BOE monetary policy announcement! Markets had been bracing for the central bank to sound dovish with the roster of recent data coming in below expectations. One of them was the manufacturing PMI report for January which disappointed the market’s 51.0 forecast when it came in at 50.8. Let’s also not forget that the NIESR also downgraded its growth forecast for the U.K. from 1.1% to 0.7%. However, it seems that recent string of negative data was not enough to alarm the British central bankers. The MPC kept interest rates steady at 0.50% and made no changes to the amount of asset purchases at 375 billion GBP. It would seem that the MPC still wants to wait a little longer for the Funding for Lending Scheme to take effect before going exploring other easing measures. According to BOE Governor Mervyn King, the mortgage market is slowly beginning to show signs that the program is working since it was started in August. On the other hand, Carney’s appearance at the British Parliament proved to be more interesting. For one, a lot of market junkies found it amusing that lawmakers scrutinized Carney’s £874,000 annual paycheck when he starts working as BOE Governor. But more importantly, everyone was on their toes for what he had to say about monetary policy. Last week that the Canadian had already sparked volatility on GBP pairs when he brought up the idea of GDP-targeting. This consequently led to speculations that Carney would implement radical changes to how the BOE runs things, possibly employing even more easing measures. However, in his speech on Thursday, he hinted that such changes would happen later rather than sooner as these need to be subject to very thorough analysis. Perhaps the most important takeaway from his interview at the Parliament is that he believes that the current easy monetary policy may be enough to help fuel economic growth. In fact, he said that committing to keeping monetary stimulus unchanged for a period of time would be needed to boost confidence among consumers and businesses. With that said, he made it clear that the central bank will be flexible in meeting its targets for the sake of stroking growth. Of course, because Carney sounded not-so-dovish when markets expected him to talk about aggressive easing measures, the pound immediately rallied against its counterparts. GBP/USD spiked up almost 100 pips to 1.5769 just minutes after Carney started his speech while GBP/JPY extended its rally with a 68-pip gain for the day at 146.98. The pound’s most notable rally though, was against the euro. EUR/GBP fell more than 140 pips following his speech, slipping below .8550 for the first time in 7 days! There had already been talks that the pound sell-off on the past few weeks may already be overdone. I wonder if Carney’s not-so-dovish remarks would be a game-changer for the pound. 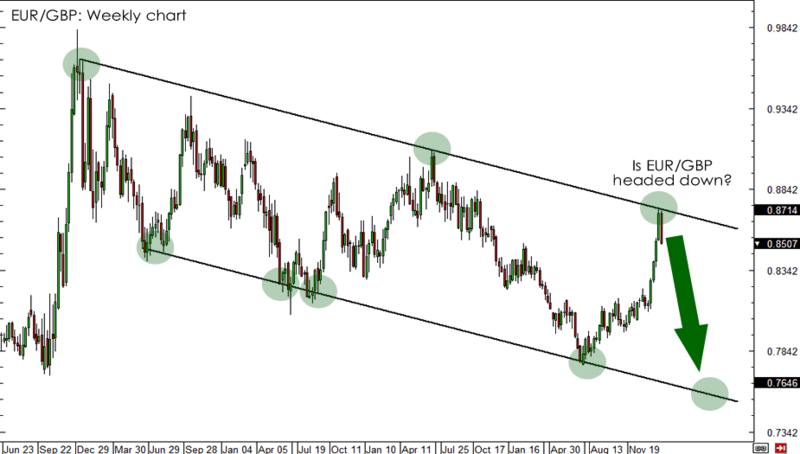 On the weekly chart, we see that EUR/GBP stopped short trading past resistance at the falling trend line. After Carney’s speech as well as a more dovish than expected ECB President Draghi, do you think we’ll soon see EUR/GBP trade below .8000? Do you think EUR/GBP is headed down to .8000?